I ran across a product called Superthrive that is marketed as a "Science Miracle" and "completely organic." What caught my attention was the $160 per gallon price tag as well as the 1950's looking package that reminded me of the types of ads I saw growing up the backs of magazines. You know, the X-Ray vision glasses, the Atlas lose weight program, Amazing Sea-Monkey's etc. I wanted to find out what this stuff was and was it worth the price. There are a lot of items in the world of organic gardening and lawn care that seem overpriced and unnecessary. Could this be one of them? Searching various forums it seems people have mixed feelings. Opinions range from wouldn't do with out it to calling it snake oil. Superthrive has been around since it won the only science and industry gold medal known to have been awarded at any official world's fair in 1940. 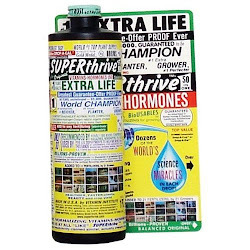 Superthrive today is still unchallanged[sic] in its effective use as a plant stimulent[sic], containing 50 vitamins and hormones necessary for healthy plant growth. Superthrive is NOT a plant food, but should be used in conjunction with a good fertilizing regimen. It is used for plant heath and maintenance, stress reducer in transplanting and increasing flower blooms, fruit and vegetable production. Its uses are endless and most important it is completely ORGANIC in nature. Popular in Hydroponics, orchards, field crops, lawn care, seed germination. Gardeners can benefit by healthier fruit and vegetables, as well as flowers and landscape plants. Dealer inquiries are welcome. Those seem to be some pretty strong claims. Well sort of. I'm always weary of products that claim to do certain things and then don't provide information regarding their ingredients and how they help. When I hear vague references to studies and a whole lot of anecdotal evidence and miracle like claims, my scam detector starts beeping loudly. Especially when they charge so much for it. It seems that you only need a few drops to mix into a gallon of water so most people won't need a full gallon to get the miraculous results claimed. The smallest size you can get is a 1/2 oz. bottle which runs for $3.20. That turns out to be around $820 per gallon. The pint size has the most reviews so lets assume that's the most popular size. At $30.99 per pint that's almost $250 per gallon. In all that time you would have thought someone would have learned how to spell stimulant and unchallenged. Now, I'm not one to talk about grammar and typos. I make my fair share of mistakes and sometimes do a poor job proofreading. But if I was going to describe a product that sells for $160 a gallon on Amazon, I just might try to run it through a spellchecker at the very least. More likely I'd have one or two people proofread it. They don't claim their spelling skills help plants grow so lets examine what they do have to say. They claim it contains "50 vitamins and hormones necessary for healthy plant growth". While the vitamins and hormones may be necessary for plant growth there is no indication that using Superthrive is necessary. Plants seem to be able to grow healthy without it. It is hard to examine the claim considering little is known about what these 50 vitamins and minerals are. The label only lists ".09% Vitamin B1; .048% 1-Napthyl acetic acid." Little else seems to be known about what is in the product. I noticed that they emphasized that it is "NOT a fertilizer". This might be because fertilizers are required to be registered. This involves disclosure of certain ingredients as well as testing. I'm not an expert but I know when things sound fishy. So I'm going to check and see if Dr. Linda Chalker-Scott has anything to say on the subject. Dr. Chalker-Scott is the Extension Horticulturist and Associate Professor, Puyallup Research and Extension Center, Washington State University. She is the Jamie Hyneman/Adam Savage of the Horticultural world, exposing popular myths. Luckily she covered this in her Myth reports. "Vitamin B-1 reduces transplant shock by stimulating new root growth"
So much for being "unchallanged[sic]". She also mentions Naphthylacetic acid, which is an auxin that can benefit root growth. Naphthylacetic acid (NAA) is also a commonly used auxin and often the active ingredient in commercial preparations. NAA tends to be toxic to seedling root development, as it inhibits primary root growth and enhances lateral root growth. This latter activity may account for NAA’s success in regenerating roots of transplanted and root-pruned trees. Like IBA, NAA apparently suppresses crown growth, which also may redirect resources to the roots. There are indications though that auxins may harm plants. If you're really interested read the whole document. Some forum posts indicated the use of Superthrive killed their plants while others have claimed it saved them. And there are pictures to prove both sides. Bottom line, while Superthrive may have some benefits when it comes to transplanting, it seems like it's greatest ability is to seperate money from gardners by convincing them to mix it in with their watering, in my opinion. We have used SuperThrive on numerous occasions. While I do agree it is kind of pathetic about the spelling and such, the product seems to truly work miracles. My parents had a jade plant that was nearly dead from frost. It had no leaves and no new growth by july, I put 1/4 tsp in 5 gallons and watered the plant, by the next week it had more growth than the ones next to it. I also used this on some of my customers plants, greatly increasing growth versus untreated plants. So to me, I wouldn't work without it. I agree! I started using it on my houseplants about once a month a year or so ago. Many of these plants were 5 years old or so at the time and were doing well. However, I can DEFINITELY tell a difference in the size and speed of growth since using superthrive. The rest of the plant is still fine, but the new growth is larger and ummm....shinier, I guess. It's also performed all sorts of miracles similar to the one in the other post. I don't know if I'd use it on food crops, but for houseplants a $10 - 4oz bottle lasts a year or two. Well worth it in my experience. I've consistently used it on my bonsai with fantastic results. If its used as directed, in conjunction with a good fertilising routine, it really does work wonders. I laughed so much when I read the 1950's advertisement comment. hahaha I'm branded GenX, but I felt that way, too, when I first saw the bottle. Does this stuff really work? yes this stuff works i always put it on my vegetables when they are young and they grow so vibrant and large they have a glo that fertilizers don't give them. I use it with organic fertilizers and use when its going to rain, the rain water seems to compliment the vitamins very well! Could you check your spelling? "it's greatest ability is to seperate money from gardners"
Please check out "weary" vs "wary." I agree as the leaves of all my plants are dark green and they are really growing and blooming now. I was looking for more products from this company when I saw the previous comments. The comment on the packaging that induced me to buy it was "Makes difficult plants easy." I only use it on certain plants that are less-than-ideally adapted, and it does seem to help. Examples: Pinus remota, for which it's too wet here; Nyssa sylvatica, too dry; Ginkgo biloba, too hot; azaleas, too alkaline; Rohdea japonica, too sunny. It could be my imagination, but all of these plants, plus others, seem to grow and look better if they get this product once or twice a year. The ginkgo and the pinyon especially seem to appreciate it. One more yes vote. I used it as a foliar spray with a super soaker on a tall tree, presoak my transplants with it. May cause mutations on seedlings. To my experience it only has any benefits on plants in bad shape...better to not have any plants in bad shape than rely on superthrive. NOT worth the money IMHO.